Kids can explore the world with the up-to-date CHILDREN'S ATLAS OF THE WORLD. Including every country and continent, each page has a detailed, annotated map, country stats, fantastic facts and amazing photography. Each continent and country is illustrated with a full-colour physical map, annotated with capitals, towns, oceans, rivers and mountains. Amazing photographs on every page showcase key landmarks and sights for each country group, giving kids a feel for different cultures and places. Every page shows the maps in situ on a locator globe to allow kids to understand a country's position in the world. Children's Atlas of the World is a comprehensive, detailed world atlas for kids, perfect for supporting classroom work and homework. 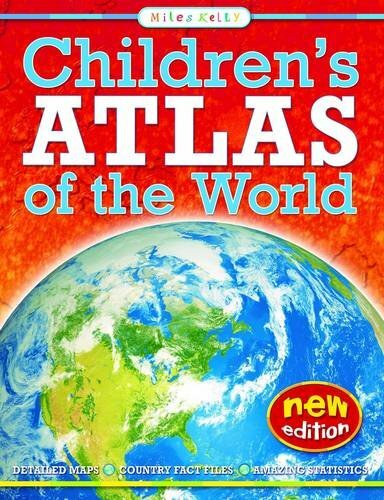 Older children will learn how to use an atlas and will gain an understanding of the world around them. This book is most suitable pupils at UK secondary school key stage 2 and 3 or US 5th, 6th and 7th grades. What are the key features of Children's Atlas of the World? A political and physical world map for kids to investigate. Each continent and country section contains up-to-date statistics, including population and area. Search and find panels list capital cities and their grid references, providing an interactive tool that will teach children how to locate features on a map using a graticule. Special features Extreme Weather, World Record and In the next minute... present the most extraordinary facts in context so children can understand the stats. Special features include: Extreme Weather: Hurricane Katrina, the largest hurricane ever recorded in the USA, caused 80 percent of New Orleans [H6] to flood. More than one million people were evacuated and 1833 died. In the next minute... at least five icebergs will fall into the oceans enough fresh water to supply London for a day. Did You Know? Modern chewing gum is made from the same gum the Aztecs chewed, with added sweetener to make it more tasty. Facts and stats: Italy's population of 60.3 million would fill 603 Olympic stadiums. Montenegro's population of 620,000 would fill six stadiums. World Record: The Sahara sand sea in Algeria has the longest sand dunes in the world, with some more than 300 km. The distance from... Australia's east coast to the west coast is 3000 km the same as from London to Boston, USA. Star fact: Mount Fuji [G9] is an active volcano, but last erupted in 1707. More than 200,000 people walk to its snow-capped summit each year.